Early Northern New York history goes far beyond the bounds of stories of pioneer families and colorful guides. As archaeologists like to say, the Western Hemisphere was invaded, not discovered. Many different societies, civilizations, or cultures existed here long before Europeans crossed the ocean and discovered “new” lands. The history of humans in the Americas is extensive. In general (and brief) terms, the Lithic stage ended about 8,000 BCE (10,000 years ago), followed by the Archaic stage, (ending around 1,000 BCE or 3,000 years ago), and then the Woodland Period, which extended to around the year 1500. 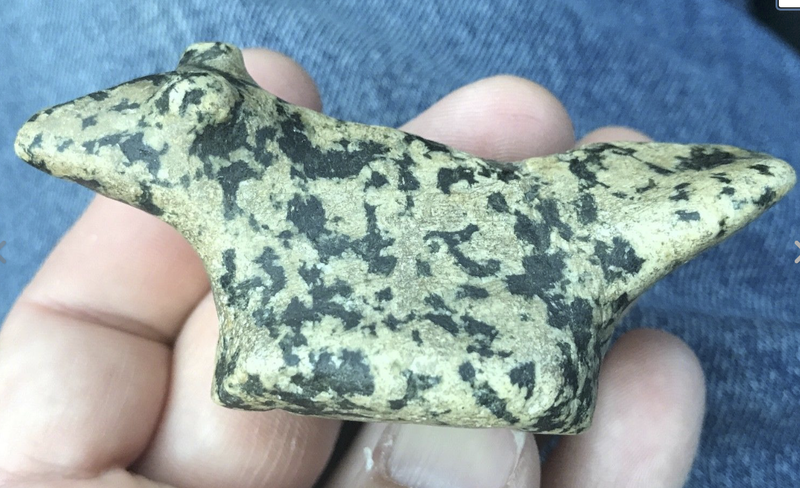 I mention this because certain North Country artifacts written about by scholars more than 100 years ago, were created during the Late Archaic or Early Woodland period, about three thousand years ago. Upon their discovery in modern times, these objects were referred to as birdstones, and whether it was accurate or not, the name stuck. The majority were found east of the Mississippi River, within a 300-mile radius of today’s northern border of Indiana (these are generalities in terms of distance). The Great Lakes region — including western New York State, a hotspot of sorts — has produced many fine examples. Discoveries made elsewhere include finds in Clinton, Jefferson, and Warren Counties. One artifact website calls birdstones “small but magnificent creations.” New York’s Metropolitan Museum of Art describes them as, “small, finely finished, oddly shaped objects, usually made of slate, but sometimes of a much harder or more highly colored stone.” Nearly all finished specimens had been highly polished, adding a certain elegance to their bearing. 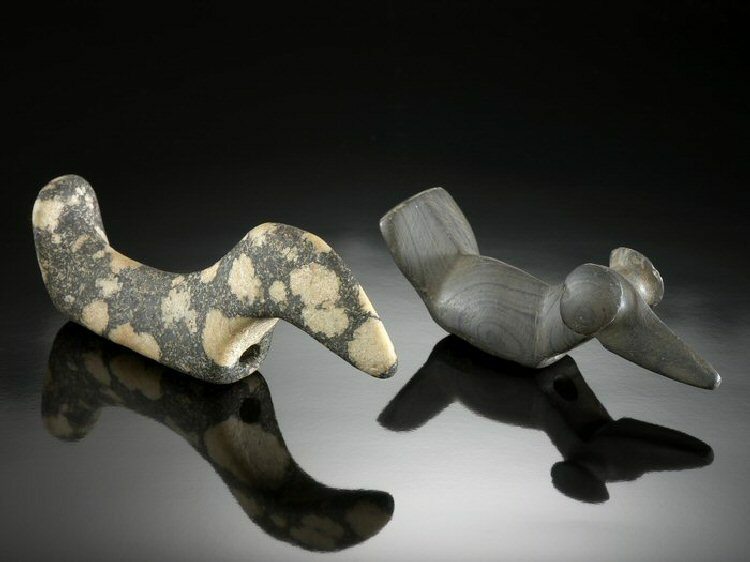 Amateur and professional archaeologists have long been fascinated by these unusual creations, admired as objects of beauty despite their sometimes odd appearance. 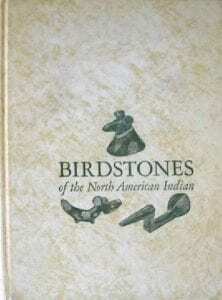 But the allure of birdstones is enhanced by a strong and lasting sense of mystery surrounding their purpose. Over the course of centuries, a range of possibilities have been hypothesized: adornments worn atop the heads of married or pregnant women; talismans used by conjurors; mountings for canoe prows; decorations to be worn necklace-style; objects used in games of chance; amulets worn for good luck; totems symbolizing certain clans; or effigies in honor of animals that provided sustenance. While most specimens are made of slate, some consist of granite, shale, limestone, and other rock types, usually resulting in finished products that were brown, gray, or red. Nearly all birdstones had two diagonal holes, one drilled through each end of the base, clearly intended to aid in mounting them to some type of surface. But the truth is, no one can say with certainty what that surface was and what purpose the stones actually served. 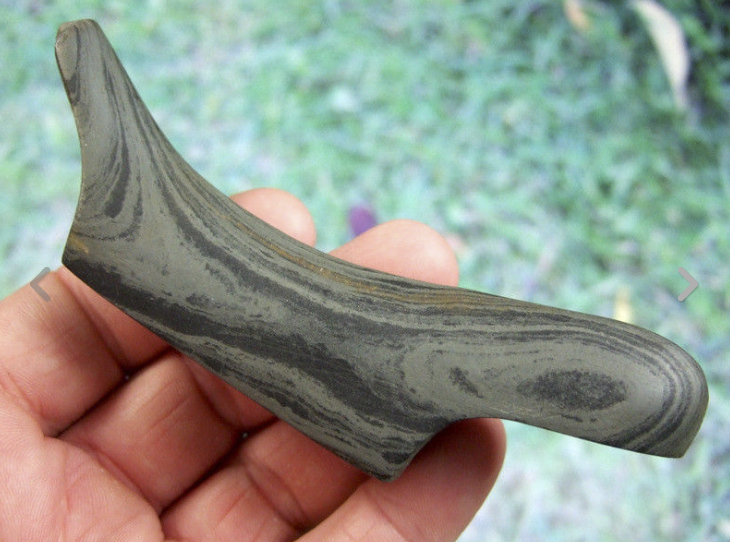 He also described two birdstone samples found in northern New York (see images). “Figure 18 is of trap rock and comes from Clinton County. It is rude, depressed, and has small ears. The general form is quite straight, but the tail is slightly raised…. The dimensions are 6⅞ long by 1½ inches high. As he did in an earlier work, Moorehead again referred to specimens found in the North Country. “A description of some of the typical New York forms will give a general idea of the characteristics of the bird-stones of this region. A specimen of bird-stone with a long, projecting beak is found in the D. F. Thompson collection and comes from Hague, New York [on the eastern shore of Lake George]. The distance from the beak to the neck is about 5 cm., the body itself being about 8 cm. This specimen is narrower than most bird-stones, and the back is less angular at the ridge. The tail, however, is typical, though a little narrow…. That spear-related hypothesis is modified by Earl Townsend in Birdstones of the North American Indian (1959), the definitive work on these special objects. 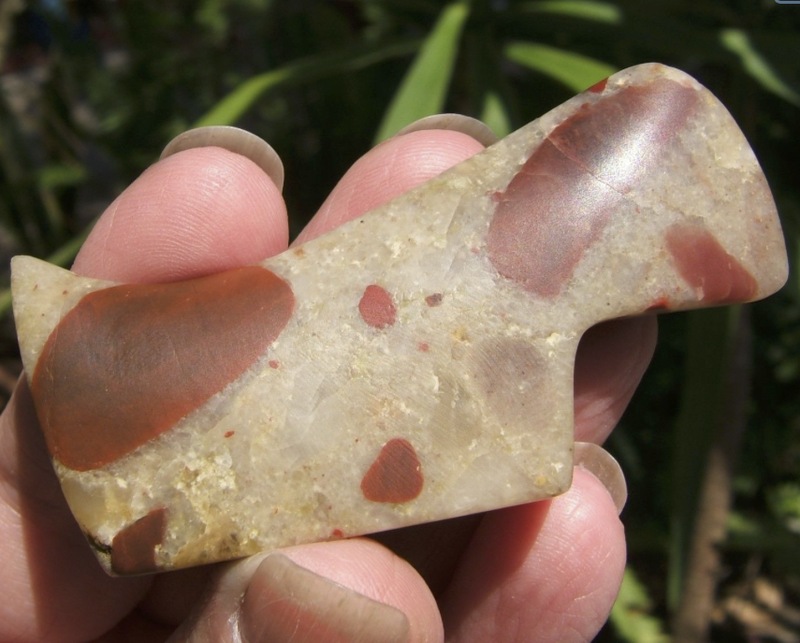 The book has a chapter titled, “The Atlatl Handle Grip Theory.” Several modern archaeologists agree with the idea, which posits that birdstones, described long ago as “comfortable in the hand,” formed the handles of spear throwers. If that sounds strange, it’s actually very interesting, so bear with me briefly and you’ll be slightly amazed. It all comes together after watching a pair of short videos. But first, a very brief explanation. Civilizations throughout history have used spears for hunting. Many discovered that the speed and accuracy of a hand-thrown spear is dramatically enhanced by using a spear thrower (atlatl), which allows a projectile to be hand-launched with tremendous power. that demonstrate the creation and use of a spear thrower. The second video depicts a pair of weights on a thrower and explains their purpose. 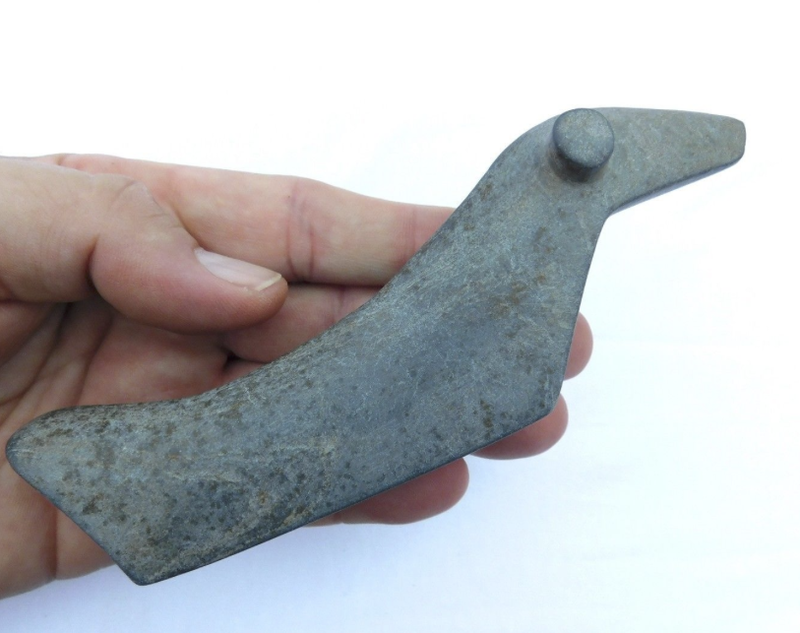 Watching these two films (and others available online) clarifies how birdstones could have been used by hunters, including those who populated the North Country a few thousand years ago, to maintain a steady supply of food. And as the phrase “could have been” implies, the mysteries surrounding birdstones endure. Lawrence Gooley, of Clinton County, is an award-winning author who has hiked, bushwhacked, climbed, bicycled, explored, and canoed in the Adirondack Mountains for 45 years. With a lifetime love of research, writing, and history, he has authored 22 books and more than 200 articles on the region’s past, and in 2009 organized the North Country Authors in the Plattsburgh area. Article from the Adirondack Almanack.